Around this time two weeks ago and a day Shima started having contractions. At the time we didn’t think much of them. We were watching Six Feet Under. We didn’t stop because of the contraction. Shima didn’t seem particularly bothered by them, all things considered. The contractions continued for some time, with some regularity. I decided we should start timing them. Timing contractions is something you see people do on TV. The first one I decided to write down was at 11:19PM; the next was at 11:25PM; so on and so forth it went. Shima was having contractions every 5 minutes or so. We tracked her contractions this way for an hour. I had the feeling being 5 minutes apart meant something was up. Google confirmed my hunch. (4 or more an hour and you are probably in labour. We were clearly well passed that point.) We called Triage at Mount Sinai to ask if we should come in right away. Since Shima’s water had not broken yet they said not to bother coming in till she was 2-3 minutes apart. We sat back down to watch more TV. 15 minutes later Shima’s water broke. In hindsight, it would have been better to nap from 6PM to when her contractions started. Six Feet Under is a pretty good show, though. Shima and I took a cab to the hospital. We arrived around 2:00AM. Triage is where the pregnant ladies go to be assessed. It’s always surprisingly quiet — the entire labour floor is. This was actually our second trip to triage that day. 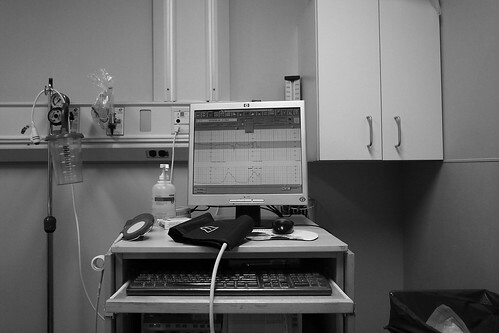 Shima had been to Mount Sinai in the morning to get her blood pressure checked out. The resident on call at 9:00AM was still on call at 2:00AM. She told us they normally do 24 hour shifts and that it’s not as crazy as you might think. Her name was Shauna and she is a lovely lady. She confirmed Shima was in fact in labour. We went on a tour of Mount Sinai as part of our prenatal class. Our instructor showed us a delivery room, warning us that it was in fact one of the “small” ones. I thought it was pretty big. The room they put Shima and I in for Shima’s delivery was one of the “big” rooms. It was pretty damn palatial. Shima was more or less all jokes when she was moved to the labour room. 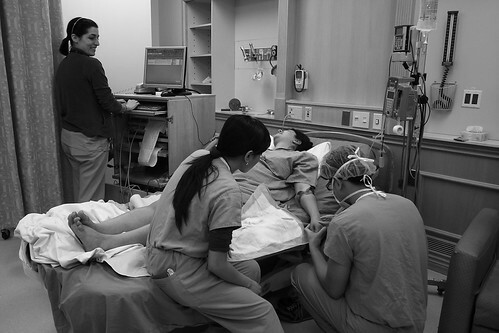 She was posting to Twitter and chatting with me and our first labour nurse Gale in between her contractions. That lasted a couple hours. By seven or so in the morning her labour wasn’t that much fun. Shima probably should have asked for her epidural a half hour earlier. Getting an epidural is gross, and I would have to say that watching Shima get one was pretty horrific. That said, speaking as a spectator, ladies you need to take the drugs. If a doctor says they can shoot some fentanyl into your back you should totally go for it. 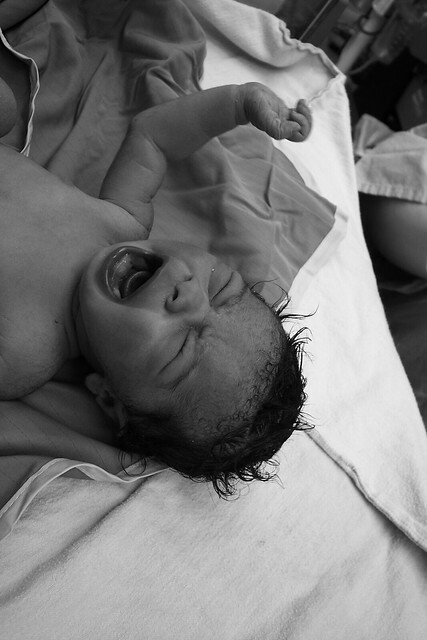 An epidural is nothing short of amazing. The whole tone of the delivery is lightened once the drugs kick in. Shima went from being in sheer agony every 5 minutes to basically feeling none of the pain: that will really lighten the mood. Labour is a slow process. We were in that labour room till about lunch time on Saturday, almost 12 hours after we arrived. Shima’s labour was reasonably eventful. At around the 10 hour mark the consensus seemed to be that she would probably need to get a C-Section. The doctors left things alone for a couple more hours before asking us again about having a Caesarean. My advice to pregnant ladies would be to either have a planned C-Section or a vaginal delivery. Of course, sometimes that doesn’t work out. Doing both is really the worse of both worlds. A Caesarean is fast. The pace is completely out of whack with everything else to do with a pregnancy. Once Shima had given the doctors the go ahead for the Caesarean section there was basically a crying baby 20 minutes later — if that. Our second labour nurse Shohlei left for her break and basically missed the entire birth. That’s how quick things went. Birth plans are these letters you are supposed to write that you can give to your doctor that outline the sort of care you want to receive. A women who is very gung-ho about having a natural birth might write down that they don’t want any drugs to speed up the labour process, or to ease their pain, etc. Shima and I were less interested in the logistics around her delivery. Our birth plan was to have a baby. We executed it perfectly. Dudes congrats! You are the coolest family I know! Awesome, I love this..Question, was I the first person to call you?